I do believe 9/11 and SARS are connected, in that they are are just different weapons in the global elite's arsenal. 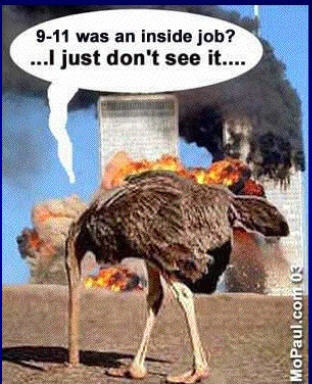 9/11 makes people fear terror attacks and lets them get away with taking on new outrageous powers in the guise of protecting us from them. Their SARS creation makes people fear infectious diseases so they can get away with taking on perhaps even greater powers, also in the guise of protecting us. For that reason, SARS (& new diseases they may come up with) deserves the serious attention of those interested in 9/11. And I don't mean that they invented SARS in a lab, as some speculate. That wasn't necessary. Here's my 9/5/03 letter to Michel Chossudovsky, a 9/11 writer and one of the editors of the Global Outlook magazine, on this topic. After not getting a response to it, I posted it around the net. Subject: Very Disappointing Article in Issue#5 on SARS! I can't tell you how disappointed and outraged I was to read your article on SARS in Issue #5 (p.51). I certainly expected to see better coverage of such an important issue from your magazine. Instead, as you'll see by the time you finish reading this short e-mail, it was actually harmful coverage. Mr. Cummins has ignored what should be the first inquiry in the SARS story, whether SARS is truly a separate, unique medical condition. There is actually no evidence to back that up despite World Health Orgranization (WHO) press releases to the contrary. (My sources appear below). Press releases aren't science and I don't expect to see in the Global Outlook magazine of all places, the simple unquestioned parroting of them from one of our many benevolent global organizations, like the IMF, World Bank, or the WHO. Mr. Cummins speculates that SARS has arisen by laboratory manipulation. However, that should only be a second line of inquiry, because, after all, who cares about its origin if it doesn't cause anybody any harm? Mr. Cummings totally missed examining whether SARS is the intentional mislabeling of other already existing illnesses (along with the unwitting mislabeling by others who accept the WHO press releases without examining any of the 'science' or 'studies' behind the claims, like Mr. Cummings failed to do). It actually gets even worse, much worse. Mr. Cummings actually suggests that countries should respond fast to the WHO's unscientific pronouncements and orders without realizing and without alerting your readers to the critical fact that, as Jon Rappoport points out, "WHO is spearheading the SARS drive to use the threat of ROGUE NATION SPREADING DISEASE TO THE REST OF THE PLANET as a sword to make nations bow down, grovel, and follow WHO medical orders. Whether those orders have to do with shutting down flights, shutting down cities and sealing them off, forcing vaccines and drugs on citizens, outlawing natural health remedies, interrogating 'suspected cases' of a disease, declaring martial law, or absorbing huge economic losses, nations must comply." This is one of the "most powerful [ways to bring about] the end of individual sovereignty of nations on planet Earth." Mr. Cummings, you, and the editors who accepted your article for publication, failed to see this true significance of the SARS story! You missed it completely and instead actually get your readers to accept this newly assumed and incredibly alarming new power a global organization has given itself. It's sadly ironic that the "Global Outlook" missed the global outlook of this story. To get up to speed quickly, so you can correct your understanding and alert your readers to the real deal in Issue #6, I recommend two sources to you. The first is to read everything that Jon Rappoport, an internet journalist, has written on the subject. His website is: <http://www.nomorefakenews.com>. On the left hand side of it, you will see a link to his free searchable archive. Do a search for all articles he's written on SARS, and read the results in chronological date order (by clicking on the column heading & "release date" to get the oldest articles first). Another good resource is <http://www.sarstravel.com>. I will offer each of you $20 if you can honestly write me after having read all of Jon Rappoport's reporting on this subject (in which he examines whether the science is sound), and tell me that you don't wish you had a very different type of article about SARS in your publication. I can't afford $60, but I believe my money is completely safe if you are honest. Also, I would so very much appreciate a response to this email that demonstrates to me that both the editors and the author of the article, whether they agree with them or not, have understood my two main points in this email - 1) that the science of SARS is not sound and parroting news releases of governmental organizations without first testing them against reality is never good journalism; and 2) that the WHO's newly assigned power is scary as can be! Otherwise, I will be afraid that I haven't written this email clearly enough to convey what I feel are these two critical points. Thank you so much for your time and attention. P.S. - To give you a taste of how readable Jon Rappoport's reporting on this story is (you don't have to be a scientist to follow it), I have copied below a tiny and telling excerpt from his work on this subject, written on May 2, 2003. May 2. WHO is putting on a SARS summit in Toronto. I guess that organization has developed a masochistic streak, because Toronto is the home turf these days for Dr. Frank Plummer, the director of the main WHO lab in Canada. Plummer has been blowing the whistle on the coronoavirus for a couple of weeks now. As I've been reporting, Plummer has said that, in suspected cases of SARS, his lab has found the reputed cause, the virus, only 80 percent of the time. Then he said that became 60 percent. AND NOW PLUMMER IS TELLING THE SUMMIT THAT HE IS FINDING THE CORONAVIRUS IN ZERO PERCENT OF NEW SUSPECTED SARS CASES. Plummer says this is puzzling. Will this be the first disease in history in which the cause is not present at all? Plummer also states his lab is finding the coronavirus in 14 percent of people who absolutely do NOT fit the definition of SARS. Perfecto. Perhaps the presence of the coronavirus is really a marker for GOOD HEALTH. It'll be interesting to see how WHO handles these devastating anomalies. Probably they will simply ignore their leading SARS researcher in Canada and pretend HE is an anomaly. "Plummer? Who is he? Never heard of him." Plummer is providing the most important evidence to date that SARS is nothing more than the very influenzas/pneumonias which have been present in all nations for centuries. The re-labeling operation has failed.